QUICK TIPS: Break Your PR’s, Then Get Back To Work! - Welcome To Staley Strategies Online Fitness Coaching! Home » Habits » QUICK TIPS: Break Your PR’s, Then Get Back To Work! I’ve written about this concept briefly a few different times, but thought I’d circle back for a deeper dive. 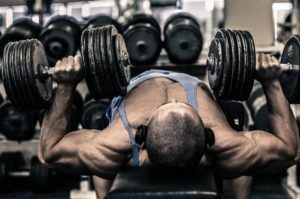 The law of progressive overload demands that we regularly and incrementally increase the training demand if we expect to see continued progress. Most of us interpret this to mean adding weight the bar, and this is a great idea, particularly because it’s an objective, measurable form of progression. But it’s only one form of progression (more on that shortly), and like all methods, it has its pros and cons. One common drawback of simply adding weight each session is that often, technique tends to erode little by little as we come closer and closer to our ultimate potential. Now within limits, this is perfectly acceptable — if your technique is just as pretty with 225×10 as it was when you did 205×10 a month ago, you probably have even more in you. When you do a true 10 RPE set (meaning, taken right to failure), by simple definition you’re doing everything and anything you can to get those reps. In other words, you’d use the “easiest” tempo, and allow for a bit of creative body English where necessary. Make sense so far? I think most experienced lifters can relate to this. Digging a bit deeper, most guys in particular just love to put as much weight on the bar as possible (and I’m not criticizing anyone here, I’m one of those guys). Getting new PR’s is one of the best experiences and it serves to fuel your training for the long-haul — all good. That being said, muscles don’t really know how much weight is on the bar, they only know challenge (which is a combination of the load, andhow you lift that load). Joints and connective tissues, on the other hand, certainlydoknow how much weight is on the bar, so that’s the potential price you pay for feeding your ego. I’m totally on board with fueling that ego, but I also feel there’s a time to not worry so much about the weight and focus on your connection or engagement with that weight. In my own training I try to do both, which is the subject of this short article. I’ll use a recent personal example to illustrate this concept. The last time I had performed flat dumbbell bench presses, my top work set was 160 (i.e, a pair of 80’s) for 10 reps, and it was hard. This being the case, the next time around my goal was to take the 85’s and ideally hit 10 reps. So, as it turned out, this past Thursday, I did in fact hit 170 for 9, but, it was a grinder, and while my form as “OK,” it certainly wasn’t pristine. That being the case, on my next set, I backed down to 150 with the goal of making those 75’s hardto lift, rather than lifting them the easiest way possible, as I’d just done with the 85’s. What I primarily mean by this is I focused on a significantly slower tempo, and a very full range of motion (including a pause at the chest). Put another way, my goal with the 75’s was to demonstrate a more complete command of the weight, which I think I managed to do. The rationale here is that you give yourself permission to first chase some numbers for ego gratification purposes, but then, with that itch having been scratched, you next get down to doing the hard but unglamorous work of placing those muscles under continuous tension and for adding some additional volume for muscle building purposes.